Get Your Dahlias Ready For Winter! Dahlias may be left in the ground over the winter; however, dahlias are susceptible to rot and/or freeze. Dahlias are not hardy, since they are a tuber (thin skinned) and not a bulb. If the freeze reaches a depth of 6" or more, then leaving your dahlias in the ground is NOT an option. 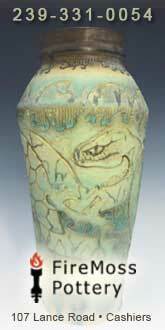 In many climates they must be dug and stored (see digging and winter storage information). 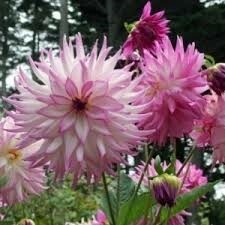 In warmer/mild states you may try leaving the dahlias in the ground over the winter. It is never a guarantee, but many Dahlia growers find that this is a more successful route compared to digging and storing. Since dahlias can rot or freeze, you must protect them. First, after a killing frost or in mid-November, cut the stalks down to below ground level. Next, cover the dahlia area with plastic to keep the winter rains off the dahlias. Finally, it is a good idea to add a few inches of mulch, leaves, soil, or straw on top of the plastic to give them a few extra inches of warm protection from the cold. In March, remove the extra layers of protection from your dahlia beds. If you leave your dahlias in the ground and would like to divide them, dig them up in the spring when you see sprouts coming through the ground. Once you have divided them, let the cuts seal/heal overnight and then replant the next day. Do not let your dahlias sit out for multiple days, as they will begin to dehydrate. Digging should be done about 2 weeks after a killing frost; the plants will turn brown if frosted hard enough. Tubers dug too early are still "green" and will not store. It is safe to dig by mid- November without a frost. Cut the stalk off to about 6", gently lift tubers with a spade or pitchfork carefully so as not to break the necks. Wash dirt from the roots and allow to air dry, protected from the elements for about 24 hours. Dividing can be done in the fall, or in the spring. If eyes are difficult to see, divide the clump into halves or quarters. Use a sharp knife to cut through the tubers. 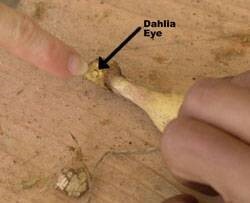 The eyes will be located on the center stalk and each root must have an eye in order to grow. 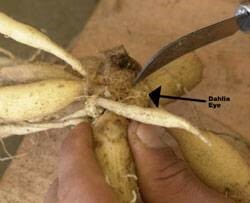 Not all tubers will have an eye. Cut surfaces should be allowed to dry overnight before storing, or planting. Use a storage medium such as pet bedding material, sawdust or cedar shavings. Tubers should be stored in crates or cardboard boxes. Line the containers with 10-12 sheets of newspaper. Start with packing medium in the bottom and layer tubers and medium until the container is full. Never store in sealed plastic bags or plastic containers. Store in a cool, dry area (temp. of 40-50 degrees). If too warm they will wrinkle/shrivel and if too cold they will freeze/rot. Check your tubers once a month throughout the winter months. 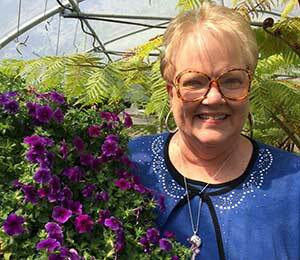 Dr. Lynn Dillard is a longtime resident of Cashiers and, along with her husband, has owned and operated Scotlyn's Yard Nursery in Cashiers since opening in 1982. Dr. Dillard appears here as a regular contributor to the community website. There are many locations in Cashiers and surrounding Jackson County that are great for all kinds of gardens and gardening. 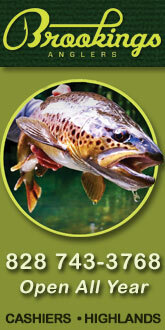 A wonderful gardening experience awaits you in Cashiers, the Heart of the Blue Ridge Mountains!